While many users feel protected when they have effective antivirus software installed, the fact remains that viruses are not the only security threats on the Internet. Spyware can especially be annoying and a huge concern for personal privacy. SuperAntiSpyware is able to detect, locate and remove many different types of spyware, trojans and adware application installed on your system. Going a step further, this antispyware program can also remove dialers and certain types of trojans. 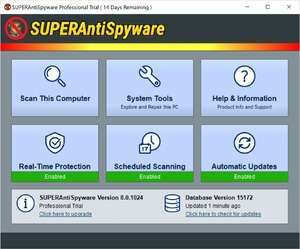 SUPERAntiSpyware Pro 8.0.1038 is a shareware program and can be used as a demo to try the software until the free trial period has ended. A full version of the program is available after the trial period ends. For security reasons, you should also check out the SUPERAntiSpyware Pro download at LO4D.com which includes virus and malware tests. Additional screenshots of this application download may be available, too. SUPER AntiSpyware Pro has a presence on social networks. SUPER AntiSpyware Pro download been highly rated by our users.